Sam, I know that you remember this little guy in my collection! As you can see, those communication cables that were released before launch we're probably toast. So they were sectioned up and distributed as momentos. Just think, there is a Randall on top of that Roman candle! Yes I do remember that one Bill! Great find. Joe, upon your urging me to reread page 188 Gaddis', I did that. As you noted in an earlier post, on page 184 Gaddis' concludes from all available evidence that on ALL flights the Astro had scales on. 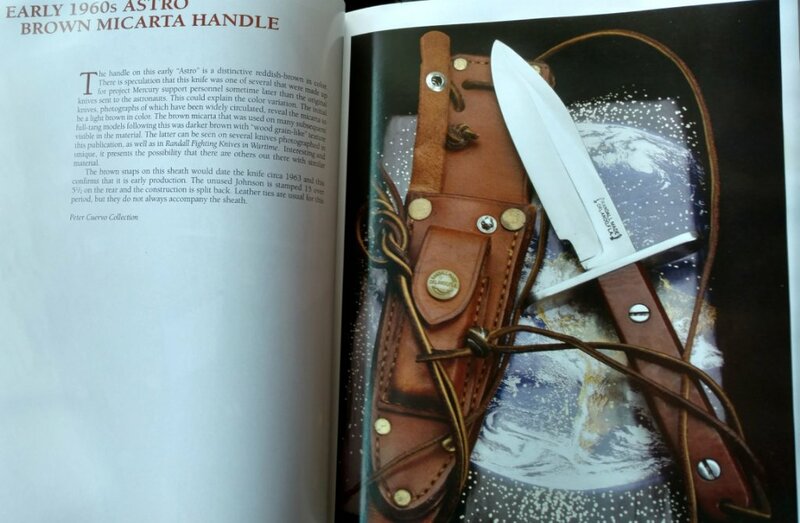 "From the very beginning, Randall literature indicated that these knives were carried by the astronauts without the Micarta handle pieces. Bo even stated this in a letter to a customer dated 27 December 1961." 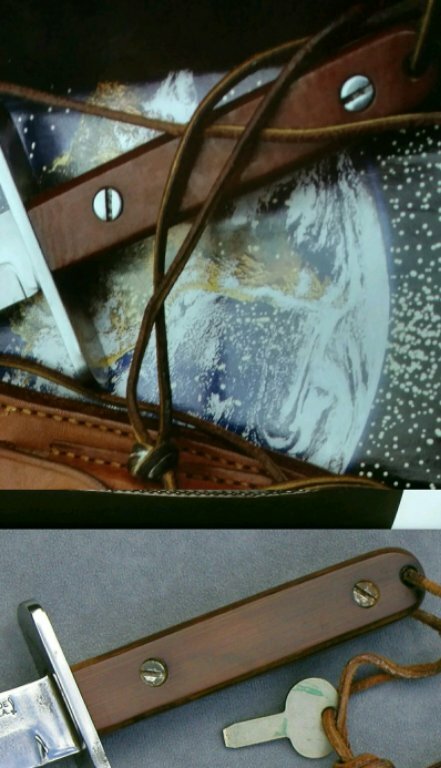 "But we have seen the photo of the original 9 Astros sent to Cooper for the project Mercury Men, and these have their Micarta handle pieces bolted in place"
Later on page 188 Gaddis' states that it was his guess that each man may have been allowed to do as he thought best in regard to the Micarta. We know that in the 2 suborbital flights, the knife was stored in the hatch. With the payload restriction of the Redstone booster, there was severe restrictions on weight. On the Orbital flights with the more powerful Atlas booster, the astronauts carried their knives in the survival pack. 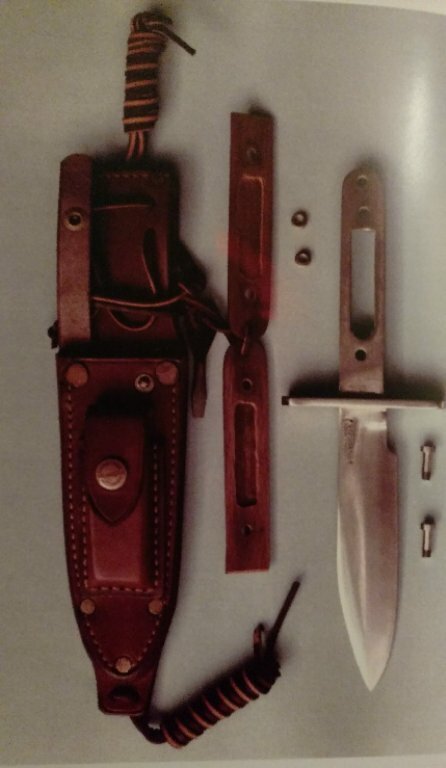 It seems that Gaddis' concluded that ALL knives were carried with scales on, based on the photos pre shipment, with the later caveat that each man could make his own decision in that regard. 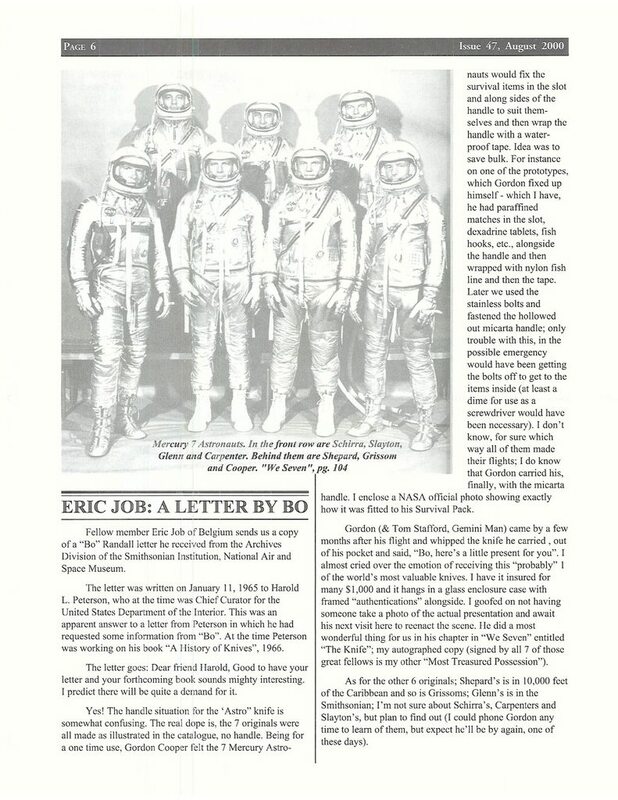 Then we have Bo Randall stating that Alan Shepard flew his without scales on, and wrote a letter to a customer to that effect. How Bo had knowledge that Shepard flew his without scales I do not know, but with Bo stating it In his advertisement, and making paperweights and tie clips without scales to illustrate that, that's provenance enough for me to believe that the 1st Randall in space didn't have scales. We know now that Grissom and at least Gordon Cooper flew theirs with scales on. "The paperweight and tie clip I am not sure are a basis for anything of substance. 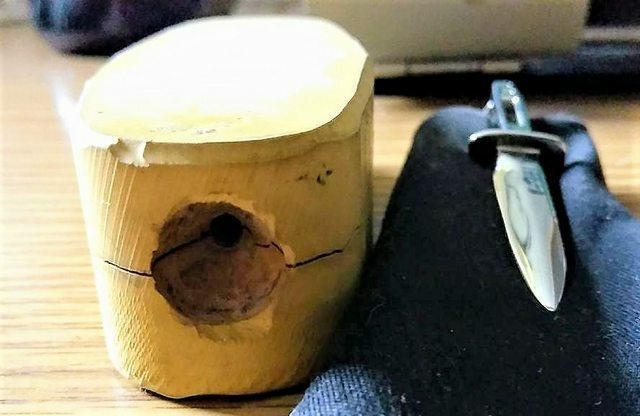 It is apparent Bo liked the design, to include it seems the tang material removed and he also apparently liked the drilled holes for attachment of a scaled (or tenite) handle material. So perhaps he simply liked the look of the overall design in its stripped down form. " It was more than that Joe. Bo claimed that Shepard flew it without the scales. A letter to a customer stated that. This was my only point, that the scaleless Astro has it's place in Randall history, rather than "merely a side note", it made history as the first in space. Give it it's due. Question, have you ever seen an early Astro made for the public that came with the early brown Micarta in a canteen snap Johnson sheath? They have to be out there don't you think? I don't recall seeing one, but I know you have observed many more Astros than I have. If so, pics would be great. 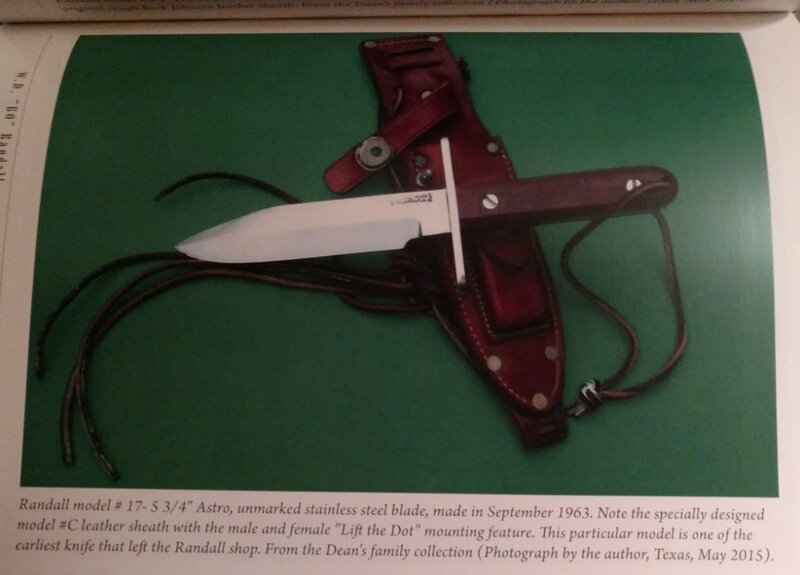 Bo Randall features the Astro without scales in every catalog, in the world famous knives section from 1961-85. The catalog changed format in 1988. Interesting that he didn't feature the knife with scales in that section, so I suspect that scaleless version of the Astro was a bit more than a "side note" in his mind. Joe, if your side note comment was aimed at overall production of the scaleless model, you seem to be right, as I have only seen 1 surface, but to say it's a minor side note to The "history" of the model, imo is not correct, as stated earlier, Mr Randall claimed it was carried by Alan Shepard, the first American in space, without scales. So historically, it occupies a prominent place in the history of the model. I think that possibly part of the reason for the lack of sales and interest, may be due to the fact that it doesn't have scales. You typically see knives with handles of some sort. As you commented earlier, "it's not practical without scales". the point is that it wasn't marketed as something to be used as a tool, it was marketed as a momento, a replica of the first knife in space. Most of the criticism that I've heard about the knife over the years is about the handle. The point is, It was a replica, a momento. It obviously has been found useful by some, the brown Micarta that I own was used by a Merchant Marine. Last edited by samg; 09-06-2018 at 08:20 AM. There ya go. Scales, no scales. Scales, no scales. Again, to me, it just isn't that big of a deal that one of the boys may or may not have taken the scales off. I think the important thing is the intent of the design and it coming to fruition the rules the day. I do not recall seeing an Astro that was made for the general public in a canteen snap sheath. 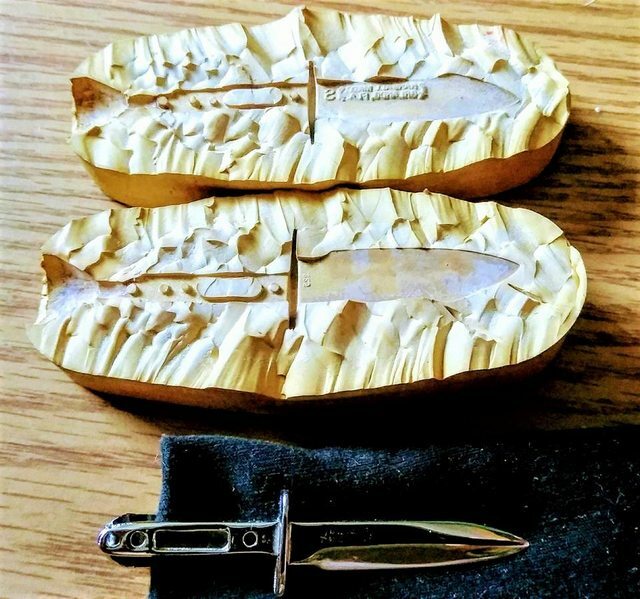 The knives were not available through normal channels when the sheaths were being used. Come to think of it, I don't know if I have seen one in a double brown button sheath. 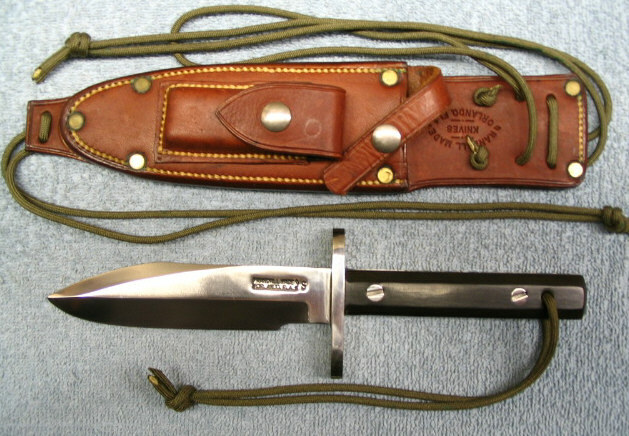 That being the case, it would lend itself to orders for the knife prior to that period were ordered w/o sheaths for display (very,very few) with a bigger influx by late 63 into 64 when the 'standard' split-back with harness rivets was in play. Just read this in Gaddis on page 187. 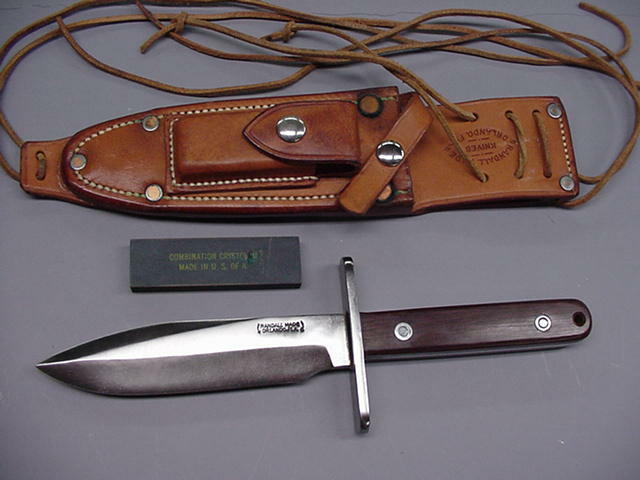 The knife was offered to the public as the model 17 in May of 1963, generally well beyond the canteen snap era and in to the standard split-back period. So, that would put it beyond the dbl brown also for all practical purposes. It would be interesting if one showed up that was legit, and probably the earliest delivered to the general public with a sheath. Last edited by crutchtip; 09-06-2018 at 08:15 AM. There was a double brown button in Hunts book. 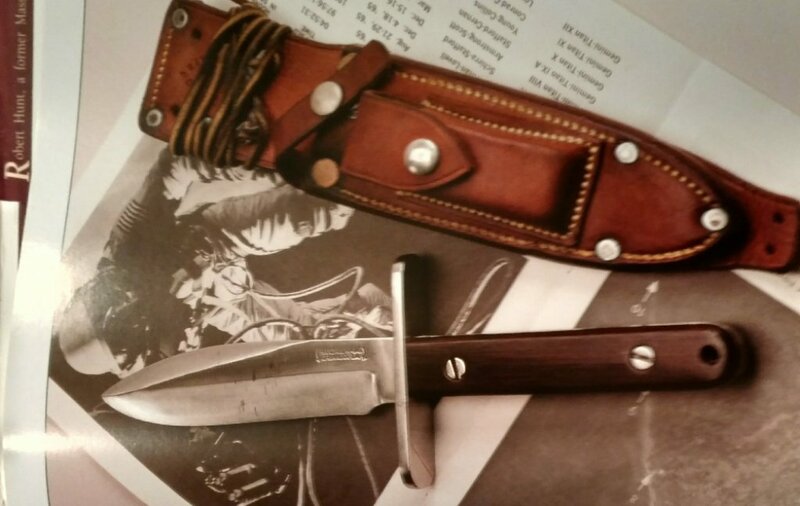 You are probably right about the canteen snap sheath, but I would think there would be public sold early brown Micarta perhaps with or without sheath, as we know they were made for customers prior to the 1963 catalog. The hunt is on. Part of the joy of vintage Randalls. Does the Astro in Hunts book appear to have the early brown Micarta in your opinion? The pictured knife looks very much like the one on the left that I own, but it definitely has the later mid-60's brown Micarta.I have noticed much variation in the distance between bolt holes in these Astros. perhaps due to the fact that they were hand done. Don't know if they had a standardized jig that they used for that, but there are definitely differences. This brown Micarta below has a different spacing for the bolts. The front hole seems to be relatively the same, but the back one is closer to the thong hole on the 2 pictured together. I have noticed that on the early training Astros too. It seems these early training Astros had larger cavities for the astronauts. Mine is not as large, but larger than the standard of later years. This would explain the greater distance between bolts. Last edited by samg; 02-13-2019 at 05:25 AM. Here is an early Astro with a lift a dot sheath. 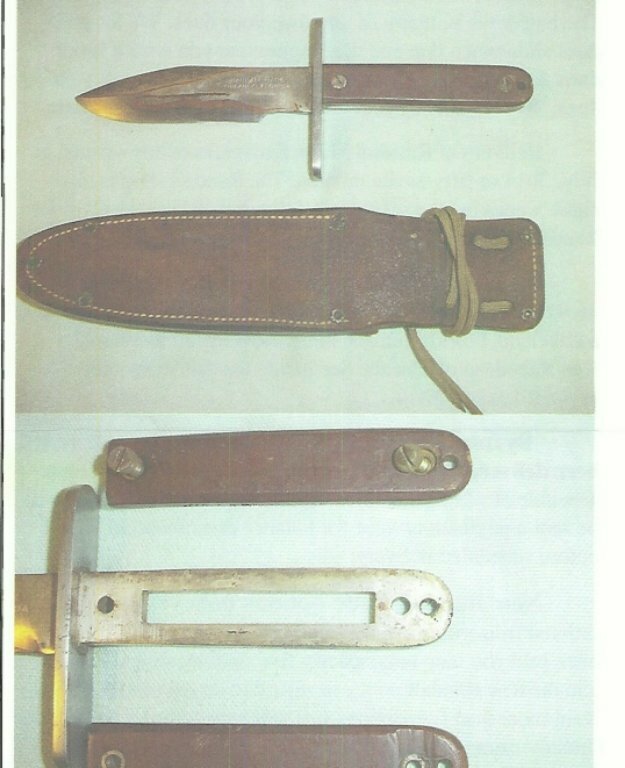 Interesting about the above photo with the lift a dot sheath is the bevel on the Micarta slab. It has a narrower flat surface than any that I have seen. Here it is enlarged, with a typical handle in the photos below it. I was illustrating in an earlier post about how close the back bolt was to the thing hole to facilitate the larger tang storage cavity. It appears that the earlier Astros had this similarity. I will track other Astros to see if that observation holds up. Last edited by samg; 03-01-2019 at 01:04 PM. Interesting photo of a Astro tie clip on it's original card from the shop. It seems that the bolt locations on the handle of these Astros varied in the early years. With the exception of the solingen training knives. The rear bolt of those were very close to the thong hole, obviously because of the larger size of the cavity. 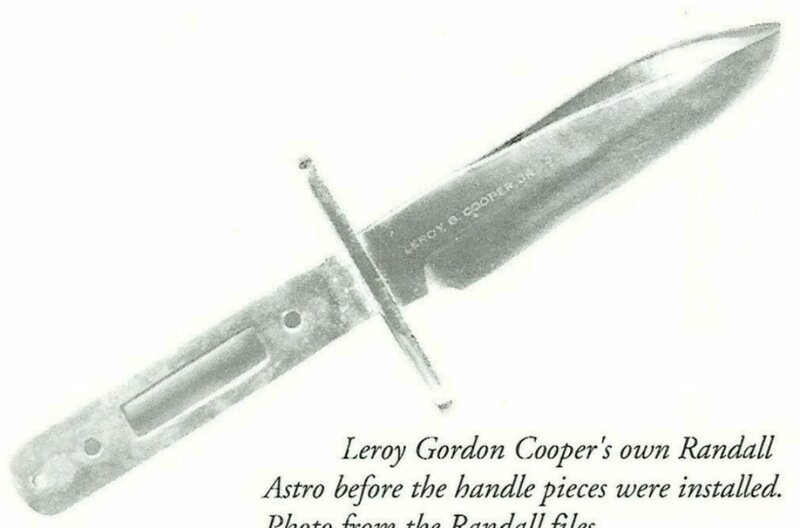 Gordon Cooper's personal knife had a regular sized cavity. The NASA training knives had larger cavities, resulting in the close relationship of the rear 2 holes. How about the final word on the first knives directly from Bo Randall? Also another interesting Astro with an Andy Thornal flare! I recently acquired an Astro Tie clip on it's original card as it came from the shop. These cards are extremely rare. This one came out of the collection of the original owner, it came from Mt Dora Fl. As you know, I have been searching for a few years for another Astro from the shop without scales. Bill has an experimental Astro with brass hilt displayed earlier in this thread, but I'm looking for another Astro, as issued from the shop with a finished tang. They were offered in the first 2 years 63-64 in the 16th printing, with the scales offered as an option. Scales became standard in 1965. If you have one, or have seen one, please post photos. This one that I have is the only one to surface that I know of. I'm sure there are many more, they just may be buried in collections. Last edited by samg; 03-01-2019 at 09:37 PM. 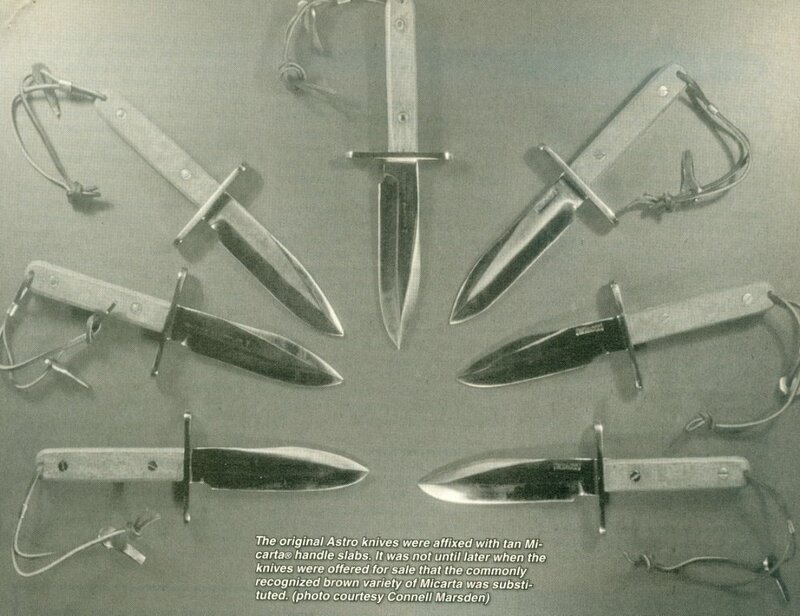 All the early Astros except the original 7 were made with modified Solingen blades and were acid etched as shown below in the De Salvo knife. This etching is also on Grissom's space carried Astro, and on some of the early pictures Sam has posted. 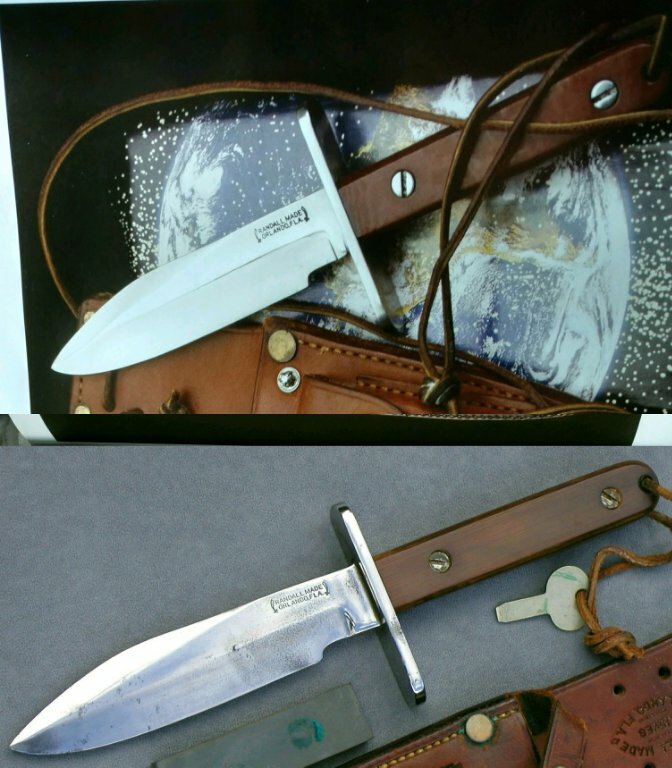 I even think most or all of the knives actually carried into space were modified Solingen blades. And yes, the originals were delivered with sheaths. I do not think Astro blades stamped "Randall made" were made or offered for sale until much later... I do think Astros with modified Solingen blades were made and were sold before the knife was catalogued. These modified Solingen blades were all ground down to the point that the original stamped Solingen trademark across the riccaso was removed. The trademark shown below was then etched ... and this etching was continued on Solingen modified blades until 1963. The Astro was developed to have a place to safely store matches and survival odds and ends...hence the screw driver to open the scales. it would have made no sense to have a bare handled Astro unless it was supposed to be a kind of "kit" knife, or was opened to illustrate the hollow interior. Last edited by Jacknola; 03-01-2019 at 09:47 PM. I do not think Astro blades stamped "Randall made" were made or offered for sale until much later... I do think Astros with modified Solingen blades were made and were sold before the knife was catalogued. These modified Solingen blades were all ground down to the point that the original stamped Solingen trademark across the riccaso was removed. 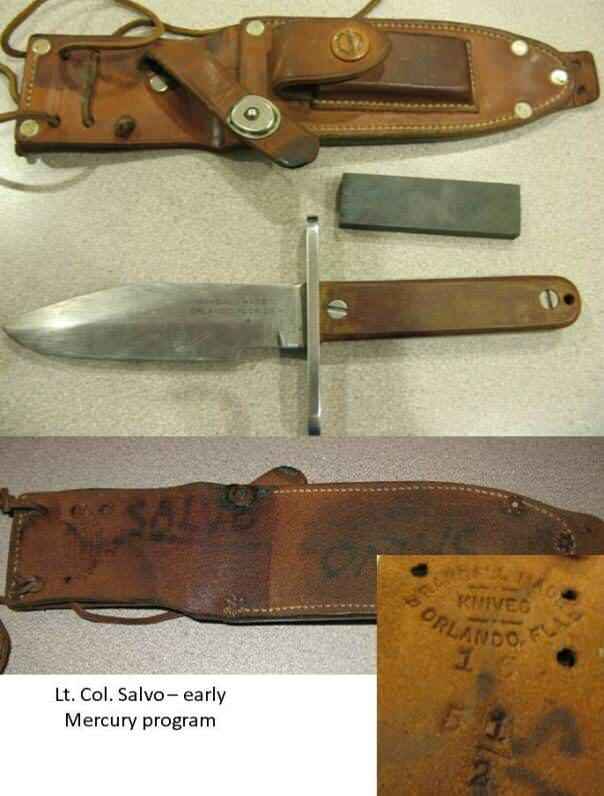 The trademark shown below was then etched ... and this etching was continued on Solingen modified blades until 1963..
Jack, the Astro knives that you are referring to, like the De Salvo knife you posted a photo of, as you noted, were solingen blades with the RANDALL MADE ORLANDO FLORIDA etching on the blades. 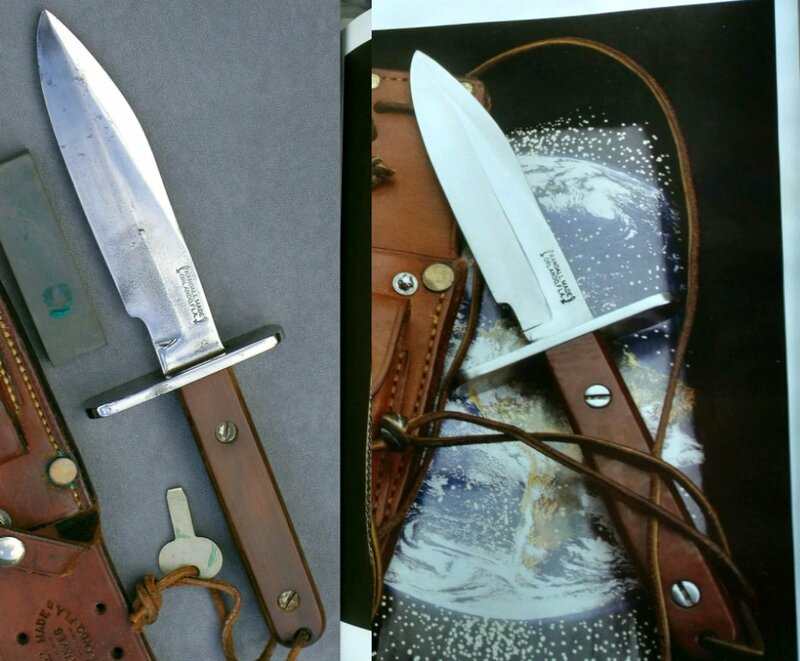 There were 20 Solingen knives ordered by Nasa in 1960. The first batch was for astronaut training. NASA then ordered 2 more batch's in 1962. Quantities of 25 and 15, for a total of 60 Randall Astro training knives. 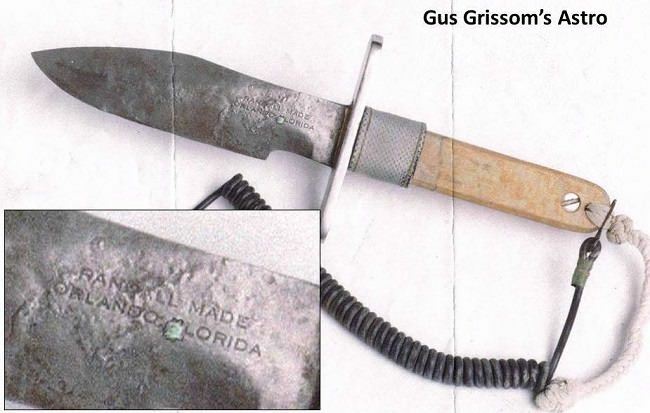 I believe all these particular knives with the RANDALL MADE ORLANDO FLORIDA etching were designated for NASA, not the public. They were etched this way to differentiate them from the Astronauts personal knives. I've not heard that the shop continued making them this way for the public. 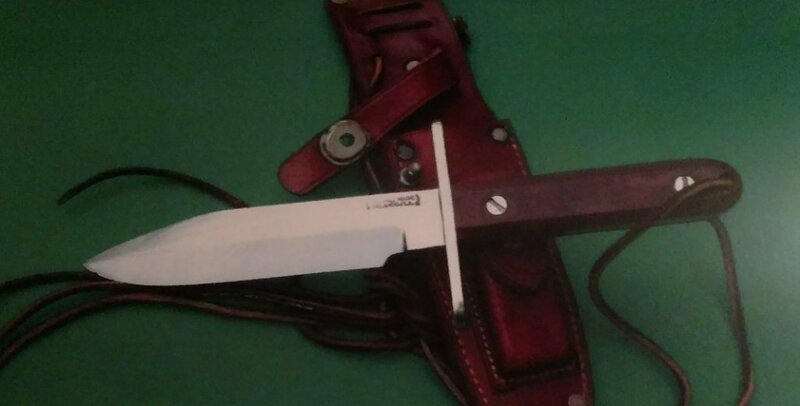 Jack, I can't disagree with your statement about "Randall Made" stamped knives coming after 1963, with the exception of the original 7 personal Astronaut knives, but then, other than the NASA knives, I haven't seen any solingen (other than NASA ordered) Astros surface either. Bill has a Solingen experimental with a brass hilt, and another was published in Pete Hamilton's book, but other than that, I haven't seen any Solingen Astros come out of a public collection. The subject Astro in this thread without scales, is speculated to have been sent to a dealer, so it's possible that it was made in 62-63. 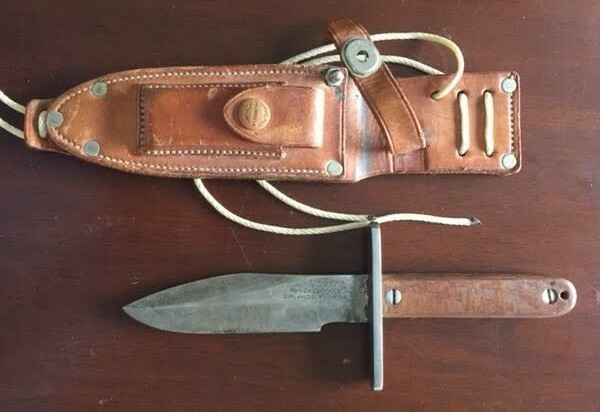 There are a couple more "Randall Made" stamped knives in double brown button sheaths, and one that I know of pictured with a canteen snap sheath, claiming 1963 manufacturing. There are many "Randall Made" examples in early baby dot, split back Johnson sheaths indicating late 62-66 manufacture. Again no Solingen Astros in any period sheath coming out of public collections. My Scaleless Astro has a large rivet, baby dot split back sheath. Knowing Johnson started using these snaps in late 62 to early 63, mine could date to then, or perhaps a bit earlier. As the Astro was designed for the astronauts and offered as a replica for the public, mine may have been sent to a dealer to explore interest before it was offered to the public, then fitted with a sheath later. Or perhaps someone ordered it without scales in the '63-'66 range. It's all speculation. Here is a photo of a Scaleless Astro above Gus Grissoms head in the Randall shop, photo from Nov 1961. 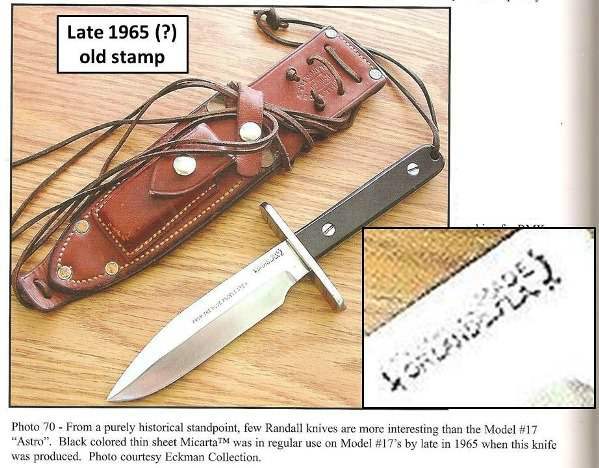 This knife may be the one that Bo Randall used for the photo in the earliest Model 17 Astro offering in the 16th printing in 1963, and in the world famous section of the catalog from 1961 14th printing, thru the 1985 27th printing. 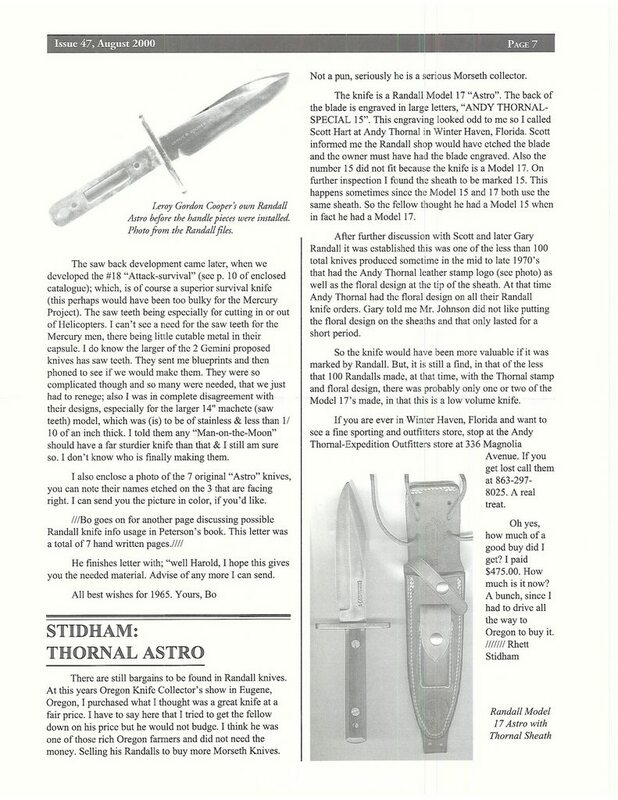 The Catalog format changed in the 1988 28th printing and the world famous knives section with the Astro was eliminated. Remember Jack, Gordon Cooper considered keeping it without scales for quite some time in the developmental stage, using nylon fishing line and waterproof tape to wrap the tang and secure the items inside. We see in a letter from Bo Randall that's in the Smithsonian, to the then Chief Curator of the Dept of the interior, where he writes about the Astros handle. 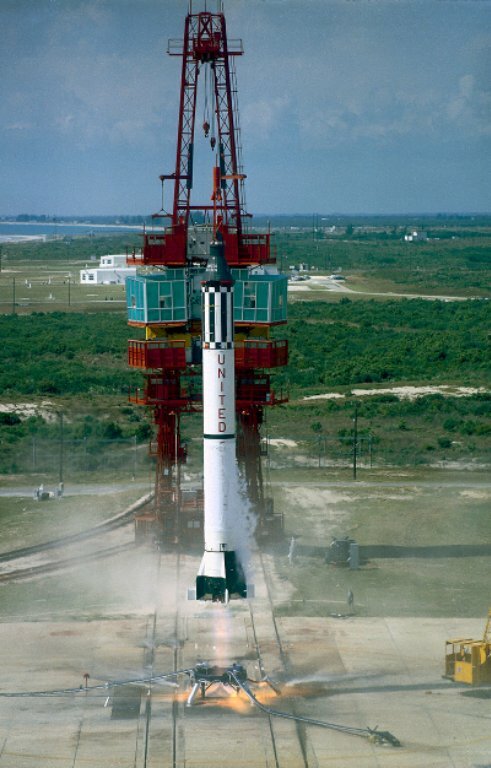 There is speculation as to whether Alan Shepard carried his with or without scales. Bo claims that Shepard did in the insert that went into the 15th printing catalog in 1963, and the tie clips and paperweight, which were designed and made in 1961 after Shepard's flight were designed Scaleless. So unless someone recovers Shepard's hatch that was blown, and sunk to the bottom of the Atlantic, we may never know. Bo must have been convinced that it was carried without scales. I guess for now, that's provenance enough for me. Last edited by samg; 03-02-2019 at 09:22 PM.